Sincere thanks to Bro. 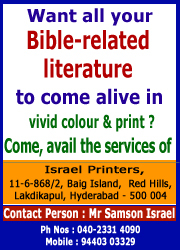 Peter Samuel, Bethel Church, Chanda Nagar, R.R. District for according the opportunity to me on 3rd May 2015 to deliver this message in the First Service of the Said Church.